awareness | MAKE BPD STIGMA-FREE! Help Declare May BPD Awareness Month in Canada! I had my Letter to the Editor about BPD and this site published in our local paper! I’m so excited! I hope it helps to raise even more awareness and encourage others to come forward. Maybe more people will join my Discussion/Support Group. Ever since I started it last fall, I’ve been the only one in the group that has BPD. We did have someone else for the first session, but they didn’t stay. It would be nice to have another person’s point of view regarding their experience with BPD. Let’s beat Stigma! 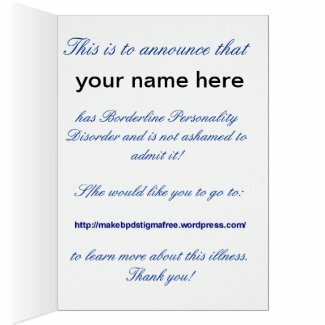 Let’s Make BPD Stigma-Free! For those of us who live with the condition (not disease) of BPD, life in the neurotypical world can be a tough old business. Our brain function marks us out to a life of the proverbial square peg that must squash and distort itself into the round holes allotted to us. We must go about our daily business as do our neurotypical counterparts. We paint a smile on our broken hearts often with great concern for our acquaintances that they do not become disturbed by the fact that we are dying inside. Its not all bad though. BPD is a “good news” diagnosis, not a life sentence. We can fully recover in a matter of years if we are lucky enough to access appropriate treatments. So it is with great excitement we embrace the month of May, for ’tis the time to be aware of BPD – callooh callay! We make our posters and wear our bracelets with pride and we feel great hope that the tide is going to turn and the treatments are going to roll our way. Or so the story goes. 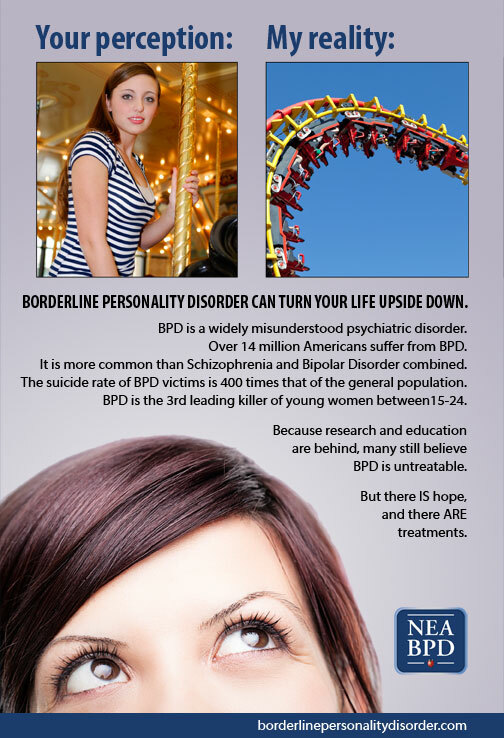 In fact the only place in the world currently where there is such a thing as BPD Awareness month is in the USA. Those like myself in the UK who believed this was our tale too were simply borrowing plumes from our good buddies across the pond. Aw, are you sad? Did you think it was your party too? Well don’t be too glum. I will tell you why I believe that we are incredibly lucky that we do not have a BPD Awareness Month in the UK and hopefully that will cheer you up a bit. The NEABPD in co-operation with NAMI pushed forward the motion for BPD Awareness month in order to improve research into, treatments for and of course awareness of BPD in the general population. Here is the online address for the resolution itself if you want to look it up https://www.govtrack.us/congress/bills/110/hres1005/text. Since 2008 when this bill was passed, the NEABPD have indeed held conferences, supported research and are making great strides in educating therapists and clincians to overcome their fear of the “dreaded borderline” and train in techniques that work rather than make us incredibly ill. So, yes much of the work that has been borne out of this awareness raising movement will benefit us, but I fear fighting stigma head on for those of us who suffer from the disorder ourselves is not a priority for the the NEABPD. In the introduction to the Family Perspectives on Borderline Personality Disorder: The Basics and Beyond – Atlanta, GA -November 4 2011, Perry Hoffman explains to the audience that the NEABPD is committed to fighting the stigma experienced by family members of a loved one with BPD. Perry believes that all family members will do anything to help their family member, but concedes that some have simply given up hope due to the manifestation of their relative’s symptoms. Families are not to blame and the NEABPD is committed to challenging the stigma that surrounds them. While I accept that many families are at a loss as to how to help their family members and that blame and guilt are redundant emotions when dealing with recovery of any nature, suggesting wholesale that those with BPD in the main have supportive family members, desperate to help them, is quite a stretch of the imagination. It raises concerns in my mind with regards to how BPD is perceived by the organisation as a whole if this is the affirmed view of its president. Not only that but it is not at all helpful to divide the stigma up between the experiences of those with BPD and the families that care. We know we are hypersensitive, its exactly that quality that means we have a great deal of insight and empathy. Raising a hypersensitive child is a very difficult thing to do, no doubt. Surely by campaigning to have this fact of our empathic qualities and our parent’s difficulties in adjusting to our needs will serve the purpose of fighting stigma rather than turning the issue of addressing it into an unhelpful dichotomy. So why is this any of my business? Well, to be honest its rather a winding and in places discouraging tale but if you wish to hear it I will tell you how it all began. I lost an online friend in May this year who had been bullied and provoked into taking his life. In the weeks leading up to his death he had been told he was a freak, incapable of love, that he was evil and the world would be a better place without him because he had BPD. After my friend died I found youtube videos he had made in the weeks leading up to his death. It broke my heart. I was shocked. How could people be so cruel to someone who was in such unbearable pain? So, instead of blocking abusive posts, as I usually do when I see something upsetting, I began to engage with these people. What I found was they were not your common or garden trolls. They were aware, in a very distorted way, of what BPD was, and they were overwhelmingly from the good ole US of A. Examples of this half knowledge were frequent references to black and white thinking, splitting, lacking boundaries and cocurring disorders. However, the cocurring disorder they referenced was never bipolar disorder, bulimia, anorexia or major depresssive disorder but Narcissistic Personality Disorder. Many had even read the latest DSM manual and advocated scrapping the term NPD because they believed it was all just BPD anyway. And worst of all they were committed to “Raising Awareness”. Bewildered and disturbed I delved further and looked on their interests and profiles to see where this bile was coming from. They weren’t awful people as I had presumed they would be. Many of them were activists for worthy causes, child protection, anti-bullying and social justice. Odd, I thought. Not what I expected at all. And another thing became apparent, they were all members of online support groups such as BPDFamily and BPDCentral. My thoughts exactly. Thank you good doctor. I didn’t bother contacting BPDFamily as I am familiar with their article “How a Borderline Personality Disorder Love Relationship Evolves” which, since coming out as having BPD online, I am frequently sent along with colourful suggestions about what I should do with myself. I suspected that attempting to reason with them would be as fruitless as trying to reason with Shari Shcreiber. Instead I posed the same question to Randi Kreger and her response was even more exciting. She advised she was hoping to write an article on this very subject. Oh, how ever so very grateful I was. She wasn’t aware that her supporters were engaging in this activity, I thought, and an article on the subject written by the very person whose works these people were misinterpretting was what I had hoped to achieve! I had reached out to someone who would take this matter in hand and provide the perfect response to people who were wrong headedly misinterpretting her material. Case closed. There were a few exchanges between Randi and I via email which left me feeling rather deflated. I had bought her book “The Essential Family Guide to Borderline Personality Disorder” which had been recommended to me as a way to reach out to my parents to help them understand. When I called they said the book had got lost in the post. It hadn’t. It was a recorded delivery but this isn’t a misery memoir so we will continue on our course. So onto Randi’s blog I went hoping to find the article in “Stop Walking on Eggshells” on Psychology Today and find out more about her work in the process. Funny I thought, as I often do when hearing that title. Thats exactly how I’ve felt all my life. Maybe I’ll find something here that will be helpful for me. By God but was I wrong! It didn’t take long to ascertain the connection between the online BPD abusers and the contents of this blog. There were some posts by guest bloggers that offered a compassionate view, but they were few and not gratefully received. The guest bloggers that bothered me, though, were those that Randi was supporting in their third party, subjective, unqualified diagnoses of BPD based on the external behaviour of their ex partners. This was exactly the concern that I was worried about. People declaring with abosulte certainty that they had experienced borderline abuse based on criteria such as cheating, lying, manipulation and controlling behaviour. No mention of intense emotional pain, just a whole catalogue of character flaws that are rife within the neurotypical population being attributed to BPD. The Great Divide: Who Has Borderline Disorder–Suicidal Cutters, “Persuasive Blamers,” or Both? Well the closest I have ever come to a suicide attempt has been once, in my youth, when I stood on the top of a tall building willing myself to jump off. There have been other half hearted attempts where I failed to react to my diabetic need to eat food to avoid entering a coma, but just at the point of losing consciousness something primal kicks in and I’d find myself lying on the kitchen floor eating cereal out of a bag. For sure suicidal ideation has been a strong undercurrent in my thoughts on how to end my pain but there have never been any serious attempts, or “threats” for that matter. And cutting? No, neurotic excoriation yes, but only as a diversionary impulse, never truly with the intention to cause pain. So in the analysis presented in this article I guess I must be a “Persuasive Blamer”. 2. They refuse to seek help unless someone threatens to end the relationship. If they do go to counseling, they usually don’t intend to work on their own issues. In couple’s therapy, their goal is often to convince the therapist that they are being victimized. 4. They hide their low self-esteem behind a brash, confident pose that masks their inner turmoil. They usually function quite well at work and only display aggressive behavior toward those close to them. Family members say these people bring to mind Dr. Jekyll and Mr. Hyde. 6. Family members’ greatest challenges include coping with verbal, emotional, and sometimes physical abuse; trying to convince the BP to get treatment; worrying about the effects of BPD behaviors on their other children; quietly losing their confidence and self-esteem; and trying-and failing-to set limits. By far, the majority of Welcome to Oz (WTO) members have a borderline partner. 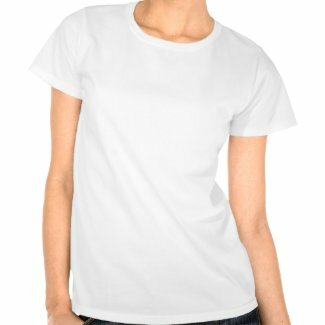 Are you buying this? Beause I’m not! Nor is any researcher in the field to my knowledge. Randi labels these HFBPDs as “invisible” simply because we do not appear on research criteria which focuses on the visible “Suicidal Cutters”. And this is exactly why Randi states in this article that it is her mission to offer support and raise awareness of this HFBPD abuse as there is no-one else who is doing it. While Randi has no qualification to theorise about or diagnose BPD, she is certainly providing an incredibly alluring message to anyone who has experienced abuse in a relationship to liberally apply the label “Borderline” on their wrong doing partners. Not only this but those who used to say their girlfriend was “crazy” for leaving them are encouraged, without assessing any other possible explanation for the breakdown of their relationship, to label their ex borderline. Perry Hoffman herself frequently invites Randi to speak at conferences introducing her with great reverence and also as a member of panels of experts discussing the need to address BPD in family situations. I needed to reach out and let these people know what I had discovered. Did they agree with this nonsense? Was Randi’s dossier of anecdotal evidence from her support forums being taken seriously by them? In the light of these revelations would they continue to be offering her their unconditional support? I reached out to others also. Valerie Porr of Tara 4 BPD, Frederic Bien of PDAN, Marsha Linehan, whose theory of “apparent comptetence” Randi had directly discredited, Shari Manning whose reference to the shame experienced by those with BPD Randi had regarded as implausible for her consumers. This was all getting far too much for me. I was staring into the abyss and the abyss was staring back at me! Jon Gunderson, Mary Zanarini, the list went on. I was frantically searching for someone somewhere who could see what I was saying and do something about it. Given the powder keg that is BPD politics I will refrain from naming the names of those who were genuinely supportive, suffice it to say they were two in number. Perry Hoffman appeared supportive at first saying that she would arrange a conference call with a number of BPD organisations in America that would be able to help me see a way to challenging this form of stigma. I waited, as I had learned thus far in my journey that pushing issues and writing long emails in a desperate state did not elicit support, but a committed response was not forthcoming. Frederic Bien of PDAN actually called me from Atlanta. I was blown away and highly encouraged. Would I write an article about this so he could post it on PDAN’s blog? I said I’d try, but writing is something that I find very difficult and indeed I am running low on my diazepam script trying to get through this without falling off the wagon that I’ve been clinging to these past three years. Instead of writing an article afresh I sent over a post that was an amalgam of comments I had left on the “SWOE” site that Randi had removed. Frederic liked it and published my article without hesitation. It is entitled “False diagnsois and the propogation of stigma”. I’m no researcher or clinician but it was certainly very pleasing to see these comments in print after they had been so forcefully censored on the SWOE blog, but I still needed to get someone with credibility to get this concern on the awareness raising agenda. But then I received another body blow. Frederic had spoken with Randi who told him how she closed down the comments on her blog because I had been harrassing and abusing her and her supporters. Frederic assured me that he understood that I would find such sites triggering but that it would not help my cause if I acted out by trying to stop Randi from engaging in the important work she was doing to Raise BPD Awarenss. I tried to reason with him but I was angry. These were lies. This was manipulation. Could he not see that? I posted him screengrabs of the “abusive” comments that Randi had alleged to receive that he had just published as a credible blog post on PDAN. And I assured him that until I found someone who could assist me to challenge the unscientific, stigmatising and dehumanising manner in which BPD was presented on her blog that those of us who found it offensive had every right to defend ourselves against it. I had been hasty in trusing PDAN as I now understand that PDAN was formed as a reaction to what Frederic and Randi perceived to be the NEABPDs lack of focus on the family agenda. Their focus is not to challenge the stigma surrounding the condition. Rather it is to prevent the development of personality disorders in children. The organisation is a mixed bag but the fact that Randi Kreger is a co-founder made me aware that by working with PDAN I would simply be adding weight to Randi’s credibility in the field of awareness raising. Not only this but on their Board of Directors is Megan Hunter, co-founder of The High Conflict institute. The HCI offer specialist services to those in relationships with people who are likely to be suffering from a personality disorder, no diagnosis required, to avoid lengthy legal battles in their attempts to safely extricate themselves and their children from the abuse they experience at the hands of their partners. On BPDCentral there are quick links to these services for those who are concerned that their partner may have BPD. So here we have yet another organisation raising awarenes with a vested interest in encouraging people to make a lay diagnosis of BPD based on their subjective experiences in relationships with abusive partners. I immediately contacted directors and associates of PDAN to tell them they needed to make a choice. Either this article was removed or my article was removed. I may have a diagnosis of BPD but posting these two articles together was nuts. Both articles are still there with my article still proudly claiming that I support the work of PDAN and the NEABPD, even though I now find the work of both these organisations highly questionable to say the least. 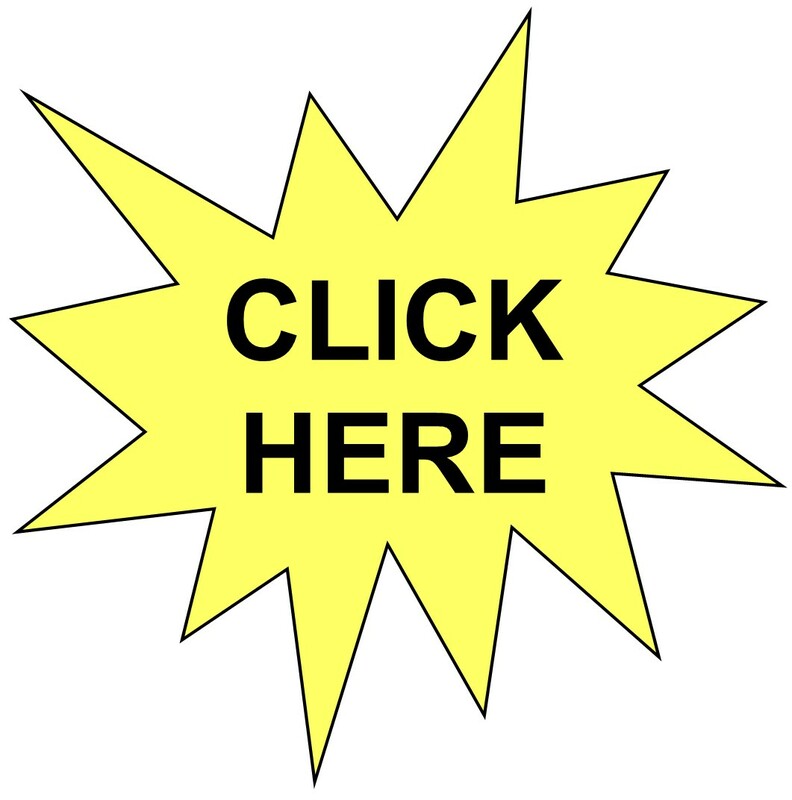 I located an article written by Valerie called “From Grief to Advocacy: A Mother’s Odyssey” that told me everything I needed to know without wasting £10 on buying her book. While her view of BPD is ostensibly a compassionate one, her belief is that abuse and neglect are not contributing factors to the development of BPD and it is the sufferer’s distorted and paranoid worldview that causes us to imagine these things. Valerie is committed to helping people recognise BPD in their family members when they are unable to see it for themselves due to their delusional thought processes. So I now understand that asking Valerie to urge people to exercise caution in liberally applying the label “borderline” is indeed anathama to Tara 4 BPDs objectives. So back I went to Perry Hoffman who finally told me that, rather than having a conference call with BPD Recovery agencies in the USA as she had promised, that she had been emailing Randi Kreger and they both thought it was a very good idea for me to be taking this campaign up with PDAN. Now why, after everything I had disclosed to Perry Hoffman about Randi’s stigmatising and damaging view of BPD did she personally think it was a good idea to be discussing these issues with Randi and recommending that I lead a campaign to raise awareness through an organisation which Randi Kreger co-founded? WHAT THE HELL WAS WRONG WITH THESE PEOPLE!!! I had contacted these organisations to raise a concern about stigmatisation of BPD. What I found is that these organisations were incestuously linked with people and companies with a vested interest in propogating stigma. Apart from Valerie Porr, but considering that Valerie said on the phone that she didn’t know anything about this BPD abuse and wasn’t taking what I was trying to say on board, I sincerely doubt she will be looking into this concern either. Learning about a mental health disorder due to reading a book or being exposed to it in an awareness campaign does not qualify lay people to make a diagnosis. Diagnosis of BPD is an incredibly difficult thing to do and it is certainly not something that a person in a relationship can do objectively by analysing external behaviours. External behaviours are no true indicator of a personality disorder. Only a qualified clinician who is up to date with current research into BPD is able to successly diagnose it by analysing the internal life of a patient with reference to their external behaviours. Even if you qualify as a clinician you will still be ethically compromised if you attempt to diagnose someone who you are related to in any way. Ideological commitment to a nefarious cause can cause neurotypical people to act in all manner of controlling and abusive ways. Before you “diagnose” someone with BPD make sure that what you are dealing with is not simply good old fashioned mysogyny/ mysandry. If you are unhappy in your relationship and your partner is in denial, then you need to get help for yourself. If you make a false diagnosis and go to get support from BPDFamily or BPDCentral then you will get yourself lost in the deep chasm of the bargaining and anger stages of grief that so many of these people are caught in. Years after your abusive relationship is over you will return to these sites again and again with your unresolved issues blaming all people with BPD for your troubles without ever having met someone who actually has the condition. If you blame BPD and do not take responsibility for your own part in accepting abuse then your abusive ex partners will continue to live rent free in your heads. If, years after the breakdown of your co-dependent and abusive relationship you are still angry and in intense pain then consider, outside of all the stigmatising nonsense that surrounds the disorder, that you yourself might be the one who has BPD. With all this unprocessed grief and anger, it is no wonder to me that those who have become caught up with the “Awareness Raising” agenda have themselves embarked on their own mission to promote “Bewareness Raising” with their unresolved passions requiring an active and communal outlet. They abuse people with BPD for sport, but when we become upset and enraged at being abused, this only feeds their fire to campaign harder. And no, you clinicians and researchers aren’t aware of this because they don’t trust you. You do not understand or accept their false categorisation of “High Functioning” BPD or add their subjective and anecdotal accounts for consideration in your work. So dear heartbroken people who blame all of us with BPD for your troubles, deal with the things you can deal with. Get therapy for your trauma. EMDR is great! I’ve had it and its very effective. Work on understanding why you were unable to manage your own boundaries in your relationship. The Gaslight Effect by Dr Robin Stern is a great book that I read that helped me to learn exactly how to do that, without encouraging me to enter the world of lay diagnosis. And now, my fellow Emotional Regulatorially challenged friends, don’t lose faith, for I understand this is a sad tale. There is hope and that hope lies with us. We were naive to trust that a bill passed through the House of Representatives in America was focussed on the ideal of making people aware that those of us who suffer from BPD are decent people, desperate for treatment and in intense pain. Bills just don’t get passed based on those criteria. In America people with BPD were an economic liability, putting strain on the penal, medical and other municipal systems. The NEABPD and NAMI made a convincing case that funding research and treatments for BPD would ease that economic burden and this is a good thing. A damn good thing. It seems that the NEABPD have chosen to focus on family stigma and have left the business of fighting stigma in general to NAMI who are already working on numerous fronts to fight for the rights of all people in America suffering from mental health problems. There needs to be a unified organisation focussed on challenging the specific and horrific stigma surrounding BPD run by someone who understands and listens to the concerns of those suffering with the condition. Without this, an unfortunate consequence of BPD Awareness Raising has been the simultaneous and damaging emergence of the “Bewareness Raising” movement. This is because what is missing from this “Awareness Raising” is a rigorous commitment to fight the stigma that we experience due to the misconceptions that we are manipulative, emotional vampires who lack insight, empathy or willingness to accept treatment. Their are individuals within the movement striving for this agenda but the organisations themselves are not. I fear that by so many organisations focusing on family issues and BPD there is a lack of understanding and representation of the fact that we desperately seek treatments and have to fight damn hard to access them. We, like our neurotypical counterparts, grow out of many of the teenage behaviours that are associated with the condition like resistance to treatment, unwillingness to accept fault, lying and manipulation. How else do you think Marsha Linehan came up with DBT in the first place? When you’ve been riding the BPD dragon for many years, those of us with the condition find great reserves of strength in order to fight for our access to treatments and have a deep awareness and insight into our own condition. We have to or we simply wouldn’t survive. Given that 1 in 10 people with BPD die by their own hand those of us that survive deserve the recognition of the depth of our struggle to fight against the grotesque portrayals of our trials at the hands of this debilitating condition. So this is why I am very pleased that in the UK we do not have a month dedicated to raising awareness in the general populace. It is precisely because before we go rolling out these agenda, we need to fight the stigma that surrounds those of us who live with the condition, otherwise you end up with half informed, angry people joining forces with organsiations who propogate stigmatising views surrounding the condition. I am proud to say that in the UK the most influential awareness raising group who won the government contract to fight for better treatments is run by a service user led organisation. They are committed to fighting stigma for all those affected by the condition, families included. When you tell someone in the UK you have BPD they say “Huh?” You tell them that its an emotional regulatory disorder whereby your brain lacks the facility to reign in painful emotions. “OK” they say. They don’t hide the knives or lock the door and turn off all the lights when you pop round for a visit. I even found myself having to explain to a policeman what it was when I was reporting an incident to them. “That must be tough” he said. I concurred. I’d like to keep it that way. A Self-Injurer’s Bill of Rights | Articles/Essays/Opinions | Creativity | self-injury.net. Pain is Not Pretty: The Reality of Physical and Emotional Pain | Living with Chronic Pain. Why Won’t Psychiatrists Diagnose Borderline Personality Disorder? Excellent blog post by You, Me and BPD. Must read! This video will bring tears to your eyes, but it must be seen! If you were ever bullied, this video will touch you deeply. Inspirational video by 19-year-old Kevin Breel!